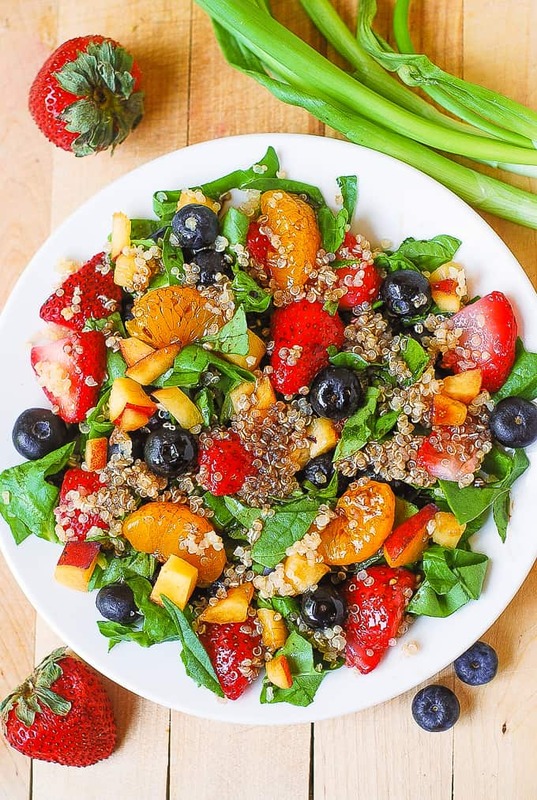 Quinoa salad with spinach, strawberries, blueberries, peaches, and mandarin oranges – a vibrant Summer salad that features lots of berries and fruit! The salad is tossed in a Balsamic vinaigrette dressing made from scratch using olive oil, balsamic vinegar, brown sugar, mustard powder, onion and garlic powders. This quinoa salad is healthy, vegetarian, gluten free, dairy free, vegan, nut free recipe, packed with fiber and nutrients. Why make this quinoa salad? 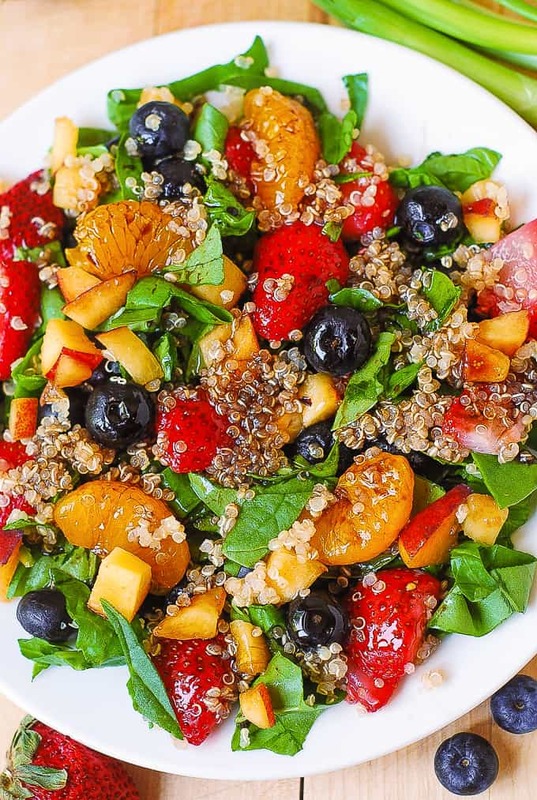 Many quinoa salads are packed with veggies, but this salad is quite different because it doesn’t have many veggies (only spinach). 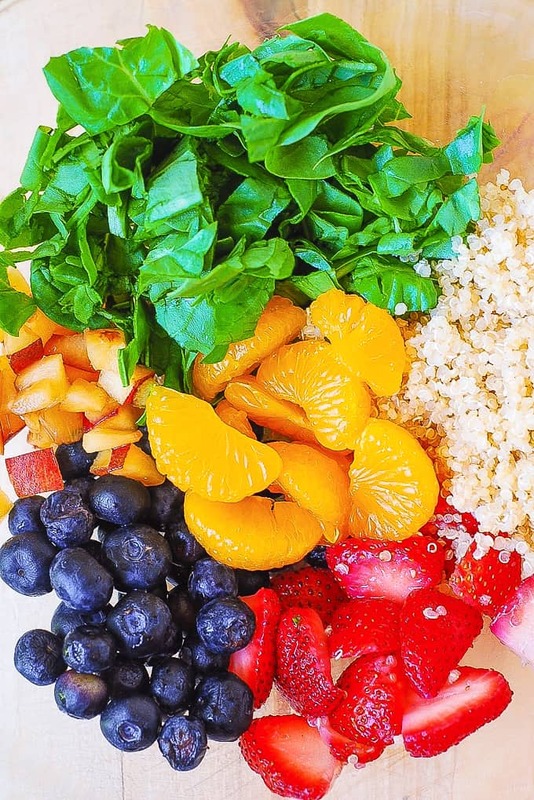 Instead, this quinoa salad features berries, citrus, and fruit. Thanks to all the fruit and berries, this is my go-to Summer salad. If you have food allergies – this salad is a great choice as it’s gluten free, dairy free, vegan and nut free! This is a great recipe to use all your leftover berries and fruit! Do you often have berries and fruit left unused in your fridge in the Summer, like I do? 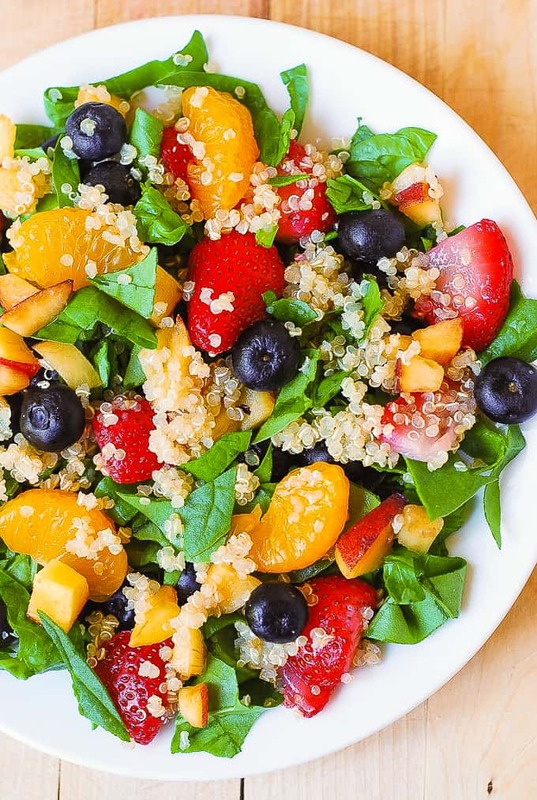 I always make this salad when I have leftover quinoa and fresh berries and fruit that I have to use ASAP so that they don’t go bad, especially in the Summer. Perfect salad for people on a gluten free diet. This quinoa salad will keep you full thanks to the protein in quinoa and all the fiber. The simple salad dressing is made from scratch, using olive oil, balsamic vinegar, brown sugar, mustard powder, onion and garlic powders. During the last 5 minutes of cooking, check for doneness and remove from heat, once the quinoa is cooked. Stir the quinoa with the spoon, fluffing it up. Cover the pan with lid, and let the quinoa rest in the pan for about 10 minutes. Quinoa is often referred to as grain, but it is actually a seed. Quinoa is related to beets and spinach, my other 2 favorite ingredients. Quinoa is gluten free, low carb, packed with protein, fiber, vitamins and nutrients. Quinoa is a healthy and highly nutritious food, providing protein, minerals, antioxidants, and vitamins. Here is an excellent in-depth article on the health benefits of quinoa. In a medium bowl, combine 1/4 cup olive oil and 1/4 cup balsamic vinegar. Add 4 tablespoons brown sugar, 1 teaspoon garlic powder, 1 teaspoon mustard powder, and 1 teaspoon onion powder. Add salt and pepper to taste. Whisk everything together in a bowl until everything is well emulsified. Alternatively, you can add all the dressing ingredients into a glass jar, close it tightly with the lid and shake the dressing in a tightly closed glass jar until emulsified. Emulsifying means to combine olive oil with the balsamic vinegar until you can see the small drops of oil and balsamic vinegar evenly interspersed throughout the salad dressing. Once emulsified, your salad dressing should have a smooth texture. Chop about 6 oz of fresh spinach. Chopped spinach will create a better texture for the salad, and it will be easier to combine with the rest of the ingredients. Clean and hull strawberries, then slice them up. You should have about 2 cups of sliced strawberries. 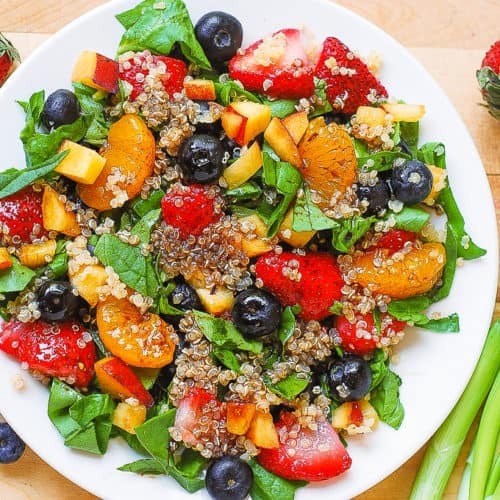 In a large bowl, combine chopped spinach, sliced strawberries, 1 cup of blueberries, and about 1 cup of mandarine orange slices (you can use fresh or canned). Chop 1 peach and add to the salad bowl. Add 1/4 cup of sliced green onions and 1 1/2 cups of cooked quinoa. Add the homemade balsamic vinaigrette and stir everything together. If you don’t have quinoa, you can use other gluten free options, such as brown rice, lentils, or buckwheat (yes, it’s gluten free even though there is “wheat” in the name). Use fresh or canned mandarin orange slices – either will work. If you have a fresh lemon, add a squeeze of fresh lemon juice to your salad. If you like a crunch to your salad, add pine nuts, sunflower seeds, or pumpkin seeds. This salad keeps well for 2 or 3 days in the fridge. If you want to make it in advance, do not add the dressing to the salad. Keep the dressing separate and add right before serving. You will enjoy the freshness and the flavor-fullness of all the ingredients in this salad! It’s full of fiber, nutrients, and even protein (from quinoa)! This recipe is vegetarian, vegan, gluten free, healthy, and just plainly delicious! Roasted Eggplant, Spinach, Quinoa, and Feta Salad – healthy, Mediterranean-style, gluten free recipe. It’s also vegetarian, low calorie, low carb and low cholesterol, high in fiber and protein (from quinoa). Quinoa Salad with Roasted Butternut Squash, Pine Nuts, Caramelized Onions and Feta cheese – with French Vinaigrette salad dressing. It’s healthy, vegetarian, gluten free, full of anti-oxidants (squash) and protein (quinoa). Spinach, mushrooms, and quinoa salad – healthy, low in carbs and calories. 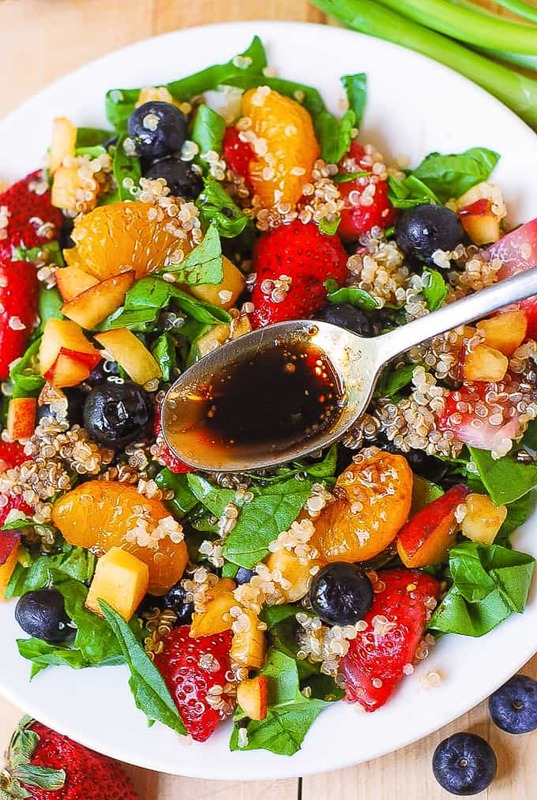 Delicious Summer salad: Quinoa salad with spinach, strawberries, blueberries, peaches, mandarin oranges in a homemade Balsamic vinaigrette dressing. The dressing is made from scratch, using olive oil, balsamic vinegar, brown sugar, mustard powder, onion and garlic powders. This healthy quinoa salad is gluten free, dairy free, vegan, nut free, packed with fiber and nutrients. This recipe was originally published on June 24, 2014 and republished with cooking tips, more information and updates in June 2018. Marco, you’re very welcome! Enjoy this recipe!